The new federal lawsuit, Whole Woman’s Health, et al., v. Lakey, et al., comprises two parts. First, it seeks an immediate court order blocking the law’s requirement that abortion providers obtain admitting privileges at local hospitals as it applies to Whole Woman’s Health in McAllen and Reproductive Health Services in El Paso—two clinics that are among the last, if not the only, reproductive health care providers offering safe, legal abortion care in their communities. Second, the lawsuit seeks to strike down HB2’s provision that every reproductive health care facility offering abortion services meet the same building requirements as ambulatory surgical centers (ASCs). The requirement, which is set to take effect September 1, would force reproductive health clinics offering abortion care to either rebuild from the ground up and become essentially mini-hospitals or close entirely—leaving fewer than 10 clinics in a state with a female population of 13 million. There would not be a single abortion clinic west or south of San Antonio, forcing many women to endure a roundtrip of more than a thousand miles to access safe and legal abortion services or cross state lines. “In our rush to do all we can to comply with yet another restriction placed on women’s access to abortion in Texas we cannot lose sight of the bigger picture; we must reject the premises these laws were passed on at its base and fight to block them going into effect, or get them overturned. 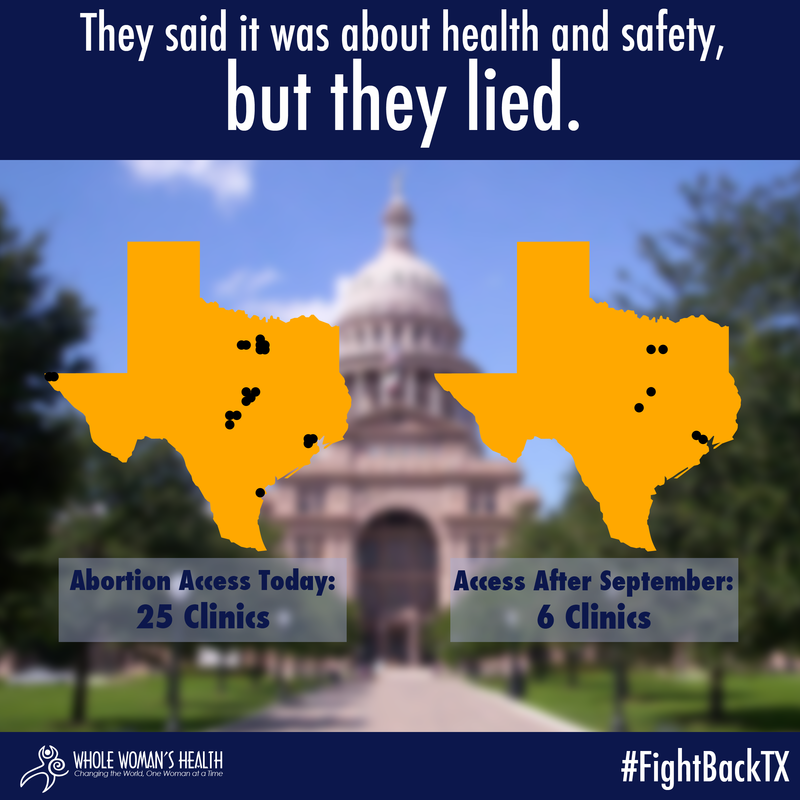 Whole Woman’s Health in McAllen has been unable to provide abortion services to their patients since the admitting privileges requirement took effect in November 2013 and most recently closed its doors entirely, leaving the Rio Grande Valley without an abortion provider and continuing to force women to travel 300 hundred miles roundtrip to the next nearest clinic. In El Paso, Reproductive Health Services was initially able to obtain temporary privileges at a local hospital, but those privileges are set to expire next month. In addition to Whole Woman’s Health and Reproductive Services, the Center also represents Abortion Advantage, Austin Women’s Health Center; Killeen Women’s Health Center; and a group of physicians who provide abortion services at these clinics. The clinics and physicians in today’s lawsuit are represented by Stephanie Toti and Esha Bhandari of the Center for Reproductive Rights, and John H. Bucy II, an Austin attorney. The Center—along with other reproductive health advocates and providers—initially filed a joint lawsuit against HB2 in September 2013, challenging the law’s unconstitutional restrictions on medication abortion as well as the admitting privileges requirement. The admitting privileges provision was initially struck down, but then took effect on October 31, 2013 after a decision by the Fifth Circuit to stay the lower court’s injunction. The results have been nothing short of devastating, leaving thousands of women who are already facing extremely limited reproductive health care options due to drastic family planning cuts in 2011 without access to health care and several clinics closing their doors across the state. Just last week­, the Fifth Circuit ultimately upheld both the admitting privileges requirement as applied to all clinics in the state and the restrictions on medication abortion. “We filed this lawsuit to stop the second-largest state in the nation from plunging millions of women back into the darkness and grave danger of illegal abortion that Roe v. Wade was supposed to end. “If these legislative attacks on women’s health care continue to take effect, fewer than 10 clinics will be available to provide abortion care to Texas’s 13 million women. Many women will suddenly face a round trip as far as 1,000 miles from their homes to obtain abortion care in Texas. “There is no question that the politicians who passed this law intended this as the final blow in their assault on women’s constitutional right and ability to safely and legally end a pregnancy in Texas. Reblogged this on Turning Texas. So much love and respect for these women…. Thank you for all you are doing for us!